Improve your underwater photography through visualization and learning to be more proactive than reactive. When shooting critter photos underwater, nature presents itself in many wondrous ways that make for many incredible photo opportunities. As a photographer it’s my job to take the time to get the shot right. Developing an idea for a shot in my mind’s eye helps me create a photo long before the opportunity arises, which ensures that I'm ready when that unique critter jumps into my lens. In an interview Ansel Adams said, “you don’t take a photograph, you make it.” When I think about that statement I realize that that's what I've been doing for a long time. Ansel isn't saying that we should have all the elements planned and staged, he's talking about going in prepared. So, as underwater photographers what can we do to prepare ourselves? The first and arguably most important step is visualization. Visualization techniques will help you get an idea of what the photo will ultimately look like, and from there you will be able to map out a way to get there. Picturing the shot in our mind's eye will help us remain focused and achieve the type of photos that we're after. You can think of visualization techniques as our own built-in software for creativity. Just like photo software on the backside, using visualization will help shape our photos on the front end of the process. As we become better at using this technique we will learn to become more proactive rather than reactive to any given circumstance underwater. 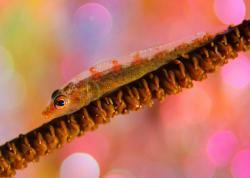 Mushroom coral pipefish F16 at 1/125. Case in point, I wanted a specific type of photo of a mushroom coral pipefish. I was searching around when I saw what looked like the perfect target, only something didn’t seem right. 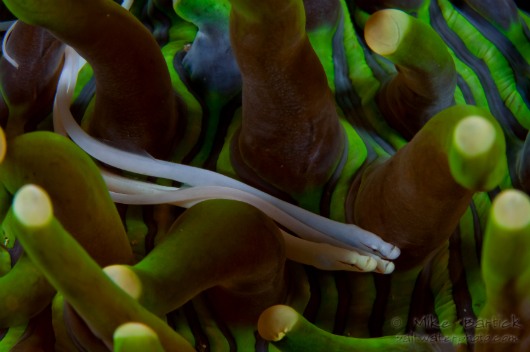 As I approached the mushroom coral I realized there was more than just one pipefish living there. This discovery changed everything, especially when I realized there were actually three pipefish. Wow! If you've ever tried to shoot a photo of one of these guys then you know how difficult it can be. 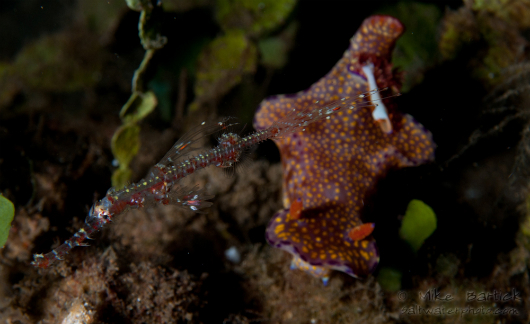 It’s a never-ending chase to try and capture one sharp image of a single pipefish, let alone three. Granted, no matter how much I prepare or visualize, sometimes all bets are off, but by knowing the shots I want to achieve I can try to capture the photo the way I want it. I love contrast in photos, and using the f-stop and lighting to help create it is critical. In the shot above I wanted to see the detail of the white pipefish against the contrasting background of the green mushroom coral. Now if only they would just cooperate and hold still! It's true that perfection is more of a journey then a destination, but it doesn’t hurt to aim for perfection. Getting a shot versus getting the shot right is the question. What is the photo you're trying to get and what are you trying to achieve? All of these things run through my head, forcing me to slow down and think effectively while still reacting fast enough to get the shot. Chasing subjects doesn’t work either, so by keeping my lens in one set position and allowing the critters to come to me I will increase my chances of getting it right. Finally the three pipefish came together and began moving in unison, allowing me just a few shots. My planned shot will have to wait for another day, but hey, three pipefish in one frame, I'll take it! 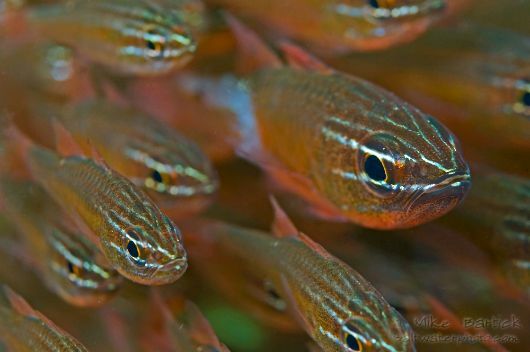 Cardinal fish aren’t an unusual sight, but the colors of these are striking. Thinking about making this type of photo in post-production and visualizing helped me to focus and create. Polarized school of cardinal fish F5.6 at 1/125. This is an unusual shade of orange and green and I wanted to make the eyes of the cardinal fish seem like they're coming out of the orange mist and swimming past my lens. By selecting my point of focus (the eyes) I used a shallow f-stop to blur the details, creating the colorful mass while allowing the viewer sharp eye contact. I consider this shot a work in progress since I am still working on the end result. I know what I want it to look like but I have to wait for Mother Nature to do the rest and present me with a small school of cardinal fish. Polarized catfish F14 at 1/125. 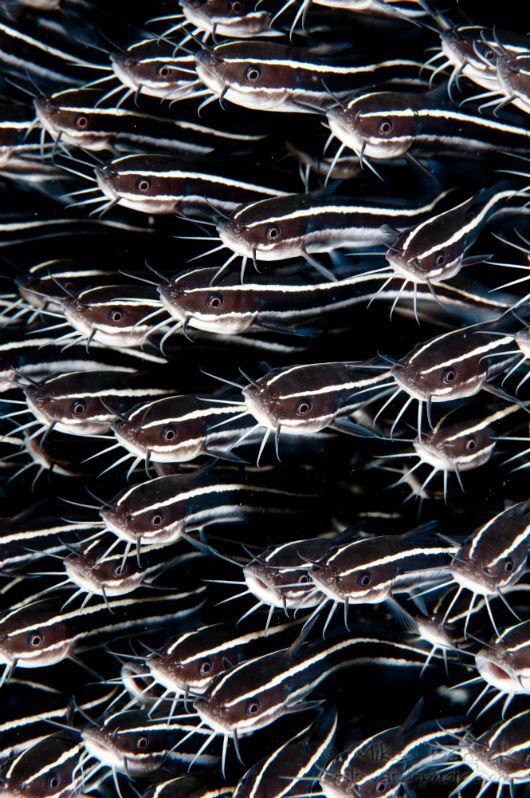 I loved the lines of these catfish and I wanted to pull them through the photo, but my main goal was to see how many eyes I could get in focus in one full frame. With a little more f-stop to gain a greater depth of field I remained in position and again let these pesky, venomous catfish come to me. Sometimes the most common subjects can make great targets. Practicing some basic hands-on techniques to help build your skills is what it’s all about, you don't always have to wait for the most exotic creatures. Goby on a colorful detailed sponge F5.6 at 1/125. Going to the extremes with the f-stops can prove to be as challenging as it is fun. I think this goby was intrigued by it's own reflection. It was the green and white mottled background that I wanted to catch, the unusual pattern and colors struck me as a really cool design, and the goby helped to break the pattern but allow for contrasting textures. 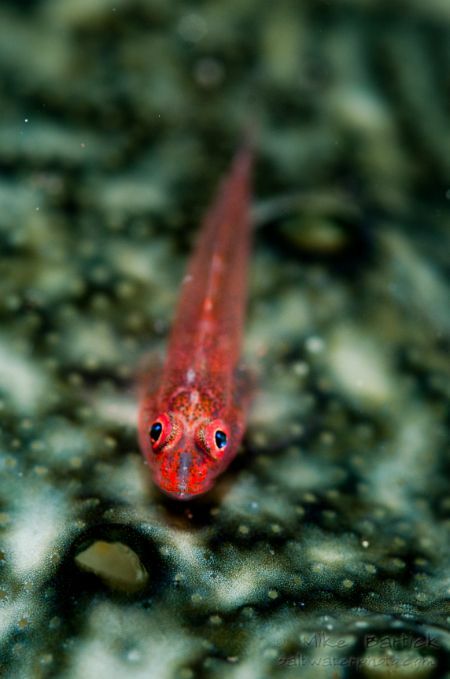 When I set up to shoot, the resident gobies scattered except for this poor guy. He slowly crept forward and into the range of my lens, I hope I didn't scare him with my strobes! Peacock flounder F5.6 at 1/125. This colorful flounder kept one eye on me and the other on his escape route. The slow approach works well, and remaining calm allows your subject to regain confidence and sometimes make an approach. 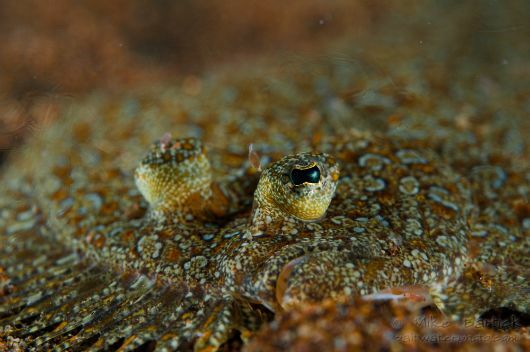 The shallow depth of field helped me to create an illusion of the flounder’s colors melding with the sand. The sharp eye contact gives the flounder a bit of personality. 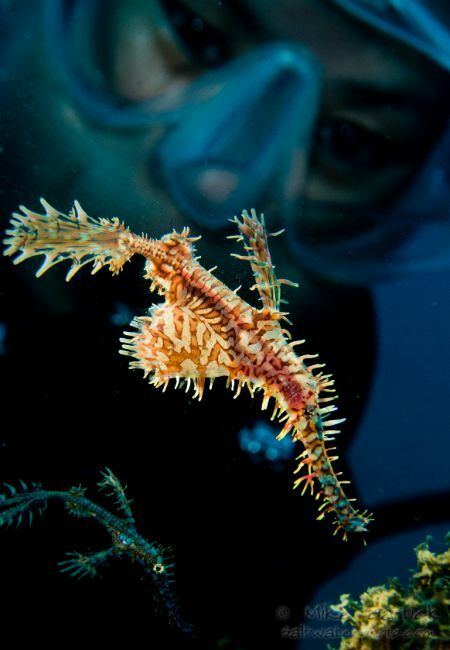 Ornate ghost pipefish F14 at 1/125. I often like to incorporate a model into my macro photography shots for several reasons: scale, personal contact, plus the added dimension can make the photos a bit more dynamic. My model used a handheld modeling light for constant off-camera lighting on the pipefish while I shot using only ambient light. I set up to watch a small group of ornate ghost pipefish work their way around a small patch of coral and between two mooring ropes. I signaled my model to approach slowly, which also helped to corral the pipefish toward my lens. Making the best out of a challenging set-up, dealing with limited access or hard angles is always a challenge, but by switching my strobes off she helped to backlight our subject and create something unique. Sometimes while lining up to shoot one photo another will often appear. This ghost pipefish wouldn’t leave me alone, swimming back and forth in front of my lens and begging for a free headshot. I really wanted to have them all lined up just right, but sometimes you have to be happy with what you can get. Being there to capture the photo using the visualization techniques we have discussed help to create the photos ahead of time, but as always, Mother Nature dishes out the rest. Self portrait, Tokina 10-17 F14 at 1/125. Overall, using skills like visualization helps us slow down enough to think effectively and ultimately be more proactive than reactive. Self-critique using your standard editing software and re-composing in post-processing will also help to visualize new ideas. Shooting photos on the fly or capturing the photos in their organic and unaltered state can be as challenging with a compact camera as it is with an SLR. Conceptualize, visualize, and shoot for yourself, but remember that no matter how much we plan for a shot, nature will always be the wildcard, for better or worse. 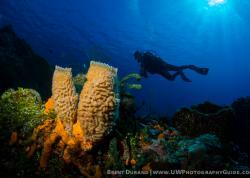 Mike Bartick is an avid and experienced scuba diver, and Marine Wildlife Photographer. 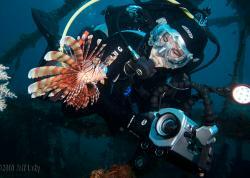 He has an insatiable love for nudibranchs, frogfish, and other underwater critters, and he is the official critter expert for Underwater Photography Guide. 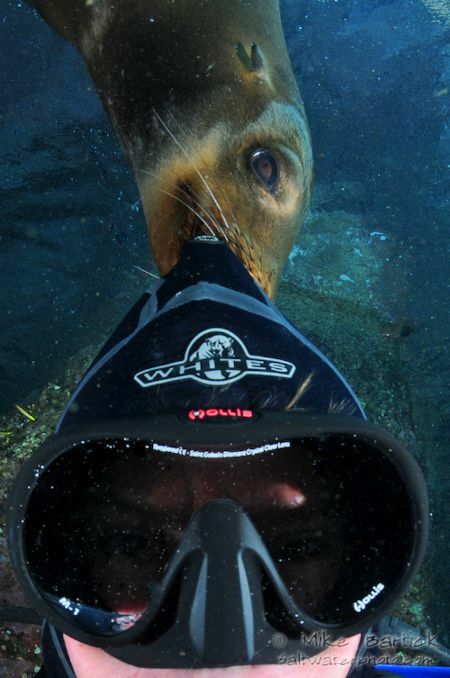 See more of Mike's underwater photos at www.saltwaterphoto.com, and at www.thecritterhead.com.